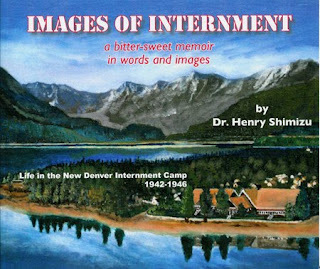 Dr. Henry Shimizu has painted 27 scenes from his days as a youth in an internment camp at New Denver, B.C. Photograph by Deddeda Stemler. Henry Shimizu has good, steady hands. 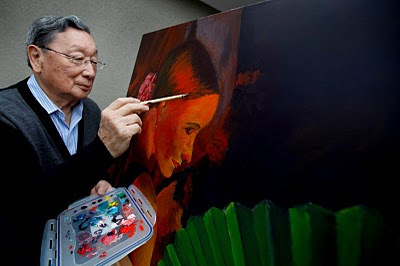 At 81, he paints marvelous canvasses. In recent years, he completed a striking series from memories of a youth spent in a Kootenay valley. Those 27 images have been exhibited throughout the province and will be included in a show in Toronto in March, offering a bittersweet account of a shameful chapter in this province’s history. For most of his working life, his hands performed miracles in Alberta, closing cleft palates, repairing burnt flesh, even reattaching severed limbs. Long before training as a plastic surgeon, he began his working life by folding napkins at the family restaurant in Prince Rupert. His father, Shotaro, known as Tom, had come to this continent from Japan in 1905 to work on the railway. He arrived two years later at Prince Rupert, an isolated port city destined for greatness as the western terminus of the Grand Trunk Pacific Railway. The boom never happened — the city’s founder, a railway executive, went down with the Titanic — but Tom Shimizu prospered. He formed a partnership with George Nishikaze, a former houseboy from Victoria with a reputation as a Western-style cook. The two men owned and operated the 30-room New Dominion Hotel and restaurant. The Tom and Kimiko Shimizu and their five children lived in the hotel. The business survived the Depression, thanks to the thrift of employing but not paying family members. The outbreak of war in Europe in 1939 brought shipbuilding contracts to Prince Rupert. Men flooded in to construct frigates and corvettes. The cook prepared 50 lunches before dawn, sending them off with the men after they finished a hearty breakfast. The two busy years brought a newfound confidence which evaporated with the terrible news delivered by radio in December, 1941. Imperial Japan had attacked the American fleet at Pearl Harbor. “My parents knew right away there was going to be problems for them,” Dr. Shimizu said. His father tried to sell the hotel immediately, but was unsuccessful. In a few weeks, the city was inflamed, neighbours turning on their peaceable fellow residents. The Rotary Club, the Ladies Orange Benevolent Society, and the local daily newspaper demanded the Japanese-Canadians in their midst be rounded up and interned. In March, 130 residents were ordered to leave the city by train. Henry, then aged 13, a Grade 7 student at Booth Memorial High, remembers a handful of classmates at the train station to see him off. “Where are you going?” one girl asked. “I don’t know,” he replied. He would never see any of them again. After several months at Hastings Park in Vancouver, he and his mother and siblings joined their father and his partner at a camp at New Denver, where the men had constructed buildings for their own internment. The Shimizus and the Nishikazes shared a three-room shiplap house, a dozen people sharing a 16-by-28-foot cabin. Years later, when he looked back on four years spent in the camp, he would recall games of hockey in winter and baseball in summer, of Buddhist festivals interrupting long days of work and study, of Japanese-Canadian soldiers visiting their families in the camp before going to Europe to fight the Nazis. The family hotel with its grand patriotic name had been seized by the Custodian of Enemy Property and sold without their permission to cover the cost of maintaining the family in the camp. At war’s end, they were still barred from returning to the coast. In 1946, the Catholic nuns who serviced the camp found his parents work in the kitchen at Misericordia Hospital in Edmonton. Young Henry and his sister got shifts as elevator operators on the weekend. Three years later, the federal government removed all restrictions on Japanese-Canadians, allowing them for the first time to vote and to join certain professional occupations. Graduating from medical school in 1954, Dr. Shimizu became one of the first Japanese-Canadian doctors in the land. After marrying Joan Miller, a nursing graduate, he did a residency in plastic surgery in Pittsburgh, where the students were encouraged to enroll in classes in life drawing. On his return to Edmonton, he co-founded the first burn treatment centre in Western Canada. In 1978, his hospital got a frantic call from a doctor in rural Rimbey, where a three-year-old accident victim needed immediate surgery. Her father rushed her to the capital. In the chaos of pre-operation preparations, Dr. Shimizu found the girl alone on a stretcher in an emergency ward cubicle. The girl had been napping in a field when her father ran over her with a hay mower. “Where is it?” the doctor asked. She pointed with her right hand to a plastic bucket that held the severed limb, wrapped in plastic to protect the skin from ice water. “Just like it was cut with a knife,” the doctor would note. At midnight, slightly more than nine hours after the accident, a surgical team including Drs. Shimizu and Gary Lobay completed the operation. The girl regained some use of the arm and the operation marked the first successful limb replantation on the continent. “She’s now a farmer’s wife in the same area,” Dr. Shimizu said. Looking back, he understands the fears that led to his family being evicted from their hotel, though he is less forgiving for the continued discrimination at war’s end. His own memories are bittersweet, for the unfairness of the act was at least matched by the determination of the younger evacuees to be successful Canadians. Named to the Order of Canada seven years ago, the honour was particularly satisfying for someone who, on the basis of ethnic heritage, had once been regarded as less than a full citizen in the land of his birth. Thanks for the interesting article about Dr. Shimizu. My parents' families were also interned during WWII in New Denver, which I visited for the first time in September of last year. Where and when will Dr. Shimizu's paintings be on display in Toronto?